one of my favourite things to host in the fall is a pizza night! justin & i make all the dough from scratch the night before. 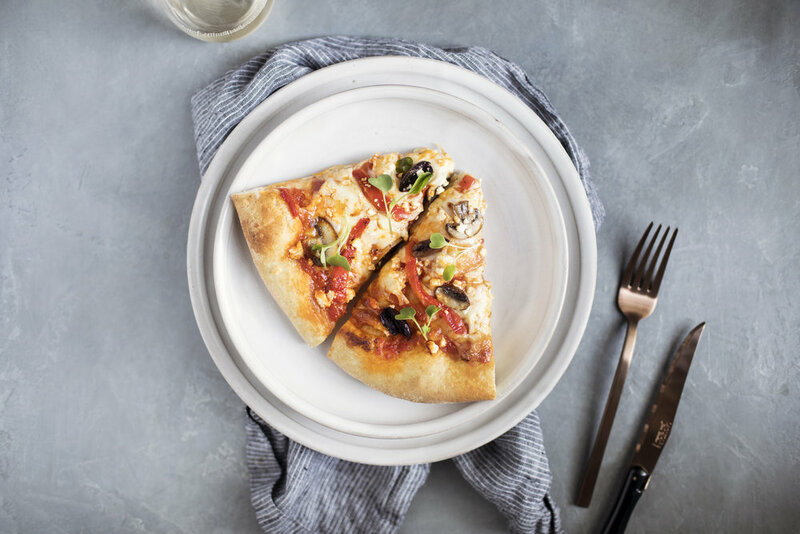 we then have each couple bring their favourite toppings to see who can create the ultimate pizza. while it is not a compeition, it is always a competition, am i right? haha pizza nights are a simple thing to host as well, as they don't take long to bake up & everything is prepared beforehand. 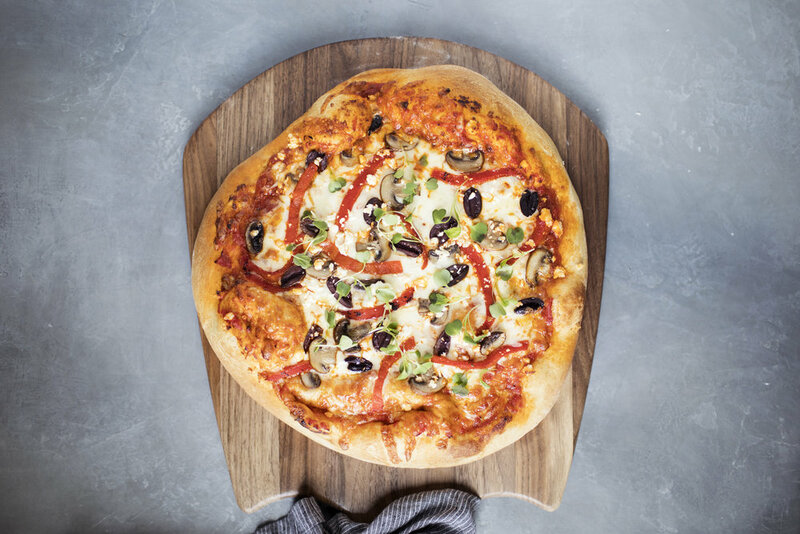 for this months pizza night, i have going to make this smoked caciocavallo & feta pizza topped with sauteed mushrooms, roasted red pepper, kalamata olives & micro arugula! both cheese featured are by saputo. the feta adds a touch of saltiness & the smoked caciocavallo is my secret ingredient. 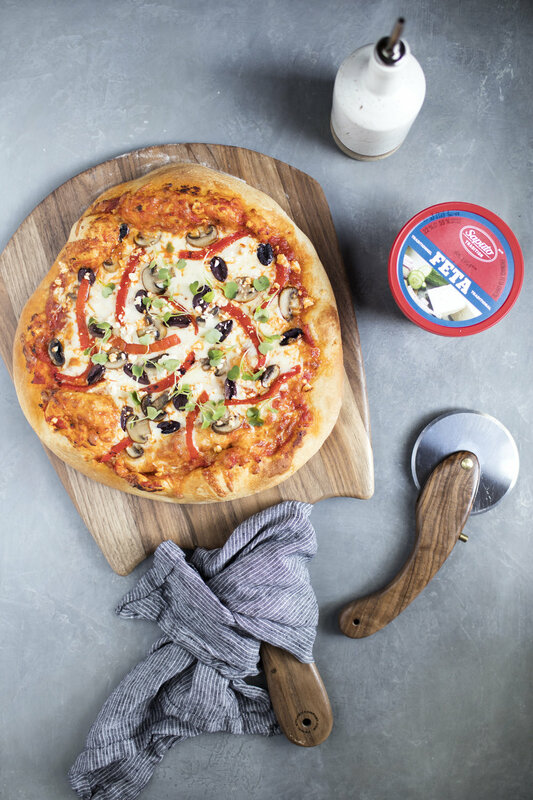 while it melts beautifully like mozzarella, it adds a smokey flavour like no other. it's hand-molded, mild & buttery, seriously.. it's the best cheese! lastly, i like to top all my pizzas with a touch of fresh greens. it adds some colour & freshness to the dish. i find the micro arugula works best! it adds a peppery flavour. while i kept this recipe vegetarian as the smoked caciocavallo brought enough flavour, a little spicy salami on top would add a nice kick too. i know my dad would appreciate the addition of anything spicy. on a floured surface roll out the pizza dough to the desired thickness. i usually roll it out to a 1/4 inch thick as the dough rises quite a bit. *note: to make the sauteed mushrooms, i simply slice them & cook them for 5 minutes in a touch of butter, salt & pepper. it adds more flavour then baking them raw on the pizza.